An eyeshadow palette containing one hundred and twenty rainbow hues perfect for creating a multitude of looks. Create everything from smokey eyes to bright, bold looks with our 120-shade palette. It combines glowing satins, shimmers, and rich mattes to make every eye look truly extraordinary. From weekday neutrals to party-perfect night-out looks, it suits every style! 2. High quality ingredients with silky shine color, can last for all day long! 3. Light and soft, easily create clear and brilliant eye makeup finish. 4. No dye and will not form an annoying eyeshadow mark! 5. Made by safe materials, would not irritate your skin. 6. The wide range of colors at this reasonable price makes this palette awesome. 7. Perfect as a gift to lover, family, friends. Wear individual colors by themselves, or layer them to create your own custom design. 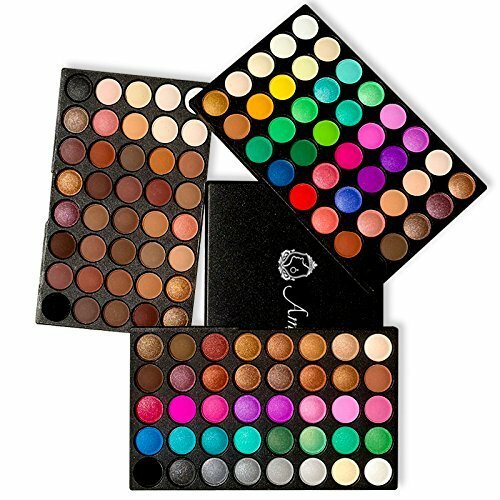 120 full color palettes eyeshadow sets shimmer. With 3 layer easy-to-carry design - palettes which are divided into 3 layers, more convenient to use. Ideal for creating a wide range of looks. Perfect for professional salon, wedding makeup, party makeup or casual makeup etc. The shadows are designed for long lasting wear, ideal for taking from day to night. 120 fantastic colours will take you through every season, providing you with every colour of eyeshadow you will ever need and suitable for different occasions especially for catwalk show makeup. Special Gift: Beautiful and elegant design, great gify for you, your family or freinds. If you have any questions about this product by AMBITO, contact us by completing and submitting the form below. If you are looking for a specif part number, please include it with your message.